The Associate of Applied Science (AAS) program is approved by the Arkansas State Board of Nursing Upon completion of the curriculum, the graduate is eligible to apply to take the National Council Licensing Examination for Registered Nurses (NCLEX-RN). The AAS and BSN programs are accredited by the Accreditation Commission for Education in Nursing (ACEN), 3343 Peachtree Road, NE, Suite 850, Atlanta, GA 30326, (404) 975-5000. Additional information is located at the Department of Nursing website. Information on the comparison of nursing programs (tuition, fees, and length of programs) may be obtained from ACEN. Traditional (24-month) and Accelerated Traditional (18-month) options are available for students seeking initial licensure. A Transition (fast-track) option is also available for qualified LPN/LPTNs, and paramedics. Courses are taught in settings ranging from the classroom, campus skills, and simulation laboratories, to major area hospitals, outpatient facilities, and other healthcare facilities. The graduate is eligible to apply to sit for NCLEX-RN exam upon completion of lower-level nursing courses and is prepared to enter professional practice settings such as hospitals, long-term care facilities, physicians’ offices, and community settings. The course of study includes 27 credit hours in liberal arts and sciences and 34 credit hours of lower-level nursing. Students who wish to earn the BSN can be admitted to the BSN and begin coursework in the program prior to completion of the AAS for a seamless transition. The Bachelor of Science in Nursing program begins with campus and clinical based coursework concentrating on essential nursing skills and concludes in an online setting with the option of working full time as a registered nurse. The goal is to obtain a Bachelor of Science in Nursing and have one year of work experience as a registered nurse. The UA Little Rock BSN program differs from traditional BSN programs as it combines the core competencies of the registered nurse with online courses focused on research, community health, and leadership that are necessary for career and academic progression. Students will progress through lower-level nursing courses while completing core courses required for the BSN. Upon satisfactory completion of lower-level nursing courses, students will graduate with an Associate of Applied Science in Nursing and be eligible to sit for the NCLEX-RN State Board Exam. The final 34 credits are taught online with students having the option of working as a registered nurse. The Bachelor of Science in Nursing (BSN) Completion option offers students who already hold an RN license an avenue to pursue a BSN. It is available as an online program. The course of study contains 53 core credit hours, which include the UA Little Rock CORE; and 34 credit hours of upper-level nursing coursework. All courses required for this program are offered in the online campus. Students who meet admissions requirements are eligible to complete this program in 12- or 18-month formats. Students who are considering a career in nursing should be aware that no application for initial Registered Nurse (RN) licensure will be considered by the Arkansas State Board of Nursing without state and federal criminal background checks by the Arkansas State Police and the Federal Bureau of Investigation. The Arkansas State Board of Nursing shall refuse to issue the RN license to any person who is found guilty of or pleads guilty or nolo contendere to any offense listed in Act 1208 of 1999. For details refer to the Arkansas Nurse Practice Act Sub-Chapter on Licensing: www.arsbn.arkansas.gov/lawsRules/Documents/SUBCHAPTER-3.pdf. Persons requesting initial licensure may request a waiver from the Arkansas State Board of Nursing. The Department of Nursing requires a state/national criminal background check and drug screening on all students upon admission and annually. Results may prohibit entry and/or progression in the program. Clinical agencies used for nursing laboratory may require additional criminal background checks, scheduled drug screening, and/or random drug screens for nursing students. Results of agency screening may prohibit participation in clinical laboratory. Nursing students prohibited from participation in laboratory at a clinical agency will not be permitted to maintain enrollment in the nursing program. Obtain application advising from the Department of Nursing prior to submitting an application. Have successfully completed or are eligible to enroll in MATH 1302 and in RHET 1311 or their equivalents. All developmental courses must be completed. Have successfully completed or be enrolled in 4 credit hours of Anatomy and Physiology, either Biology 1433 Essentials of Anatomy and Physiology or BIOL 1411 Introduction to Human Anatomy and Physiology I, BIOL 1412 Introduction to Human Anatomy and Physiology II. A three-hour course will not meet this requirement. Have a minimum cumulative UA Little Rock GPA of 2.0, and have a minimum GPA of 2.6 in required core courses (detailed below); GPA in required core courses is based solely on the courses completed at the time of application. Submit a completed Department of Nursing Application Form between January 1 and the priority deadline of February 28. Enclose a copy of all college/university transcripts and scores for credit by examination in required core courses. The first group of students will be accepted from this pool of applicants and will be ranked by required core course GPA. The department continues to accept applications after the February 28th priority deadline and will admit additional students based on space availability. Students who speak English as a second language must have a TOEFL score of 83 (Internet exam), 207 (computerized exam) or 540 (paper exam). Seating is limited for both the Accelerated and Traditional options. Students who are interested in the Accelerated Option must have all AAS Required core courses (detailed below) completed prior to the second summer semester of the program. Admission preference is given to students who have completed or are in progress to complete all AAS Required core courses at the time of application. Additionally, preference is given to students who have not repeated, withdrawn, or failed required Core Courses. Students who are classified as Re-Entry (see below) are not qualified for the Accelerated Traditional Option. Students who request consideration for the Accelerated Option and are not selected will automatically be considered for the Traditional Option. Students have the option of continuing into upper-level BSN coursework upon successful completion of NURS 2550 and NURS 2350. Have proof of active employment (minimum of 1,000 hours) as an LPN/LPTN over the last 2 years. Volunteer work is not considered active employment. Submit employment verification letter with application. Employment verification letter must be on official letterhead and must include either the number of hours worked by the applicant OR a statement that the applicant has worked a minimum of 1,000 hours over the past 24 months. Applicants who work as an LPN or LPTN in more than one facility may submit more than one employment verification letter if all worked hours total a minimum of 1,000 hours over the past 24 months. Or: A new LPN/LPTN graduate who has authorization to test for LPN licensure is eligible for conditional admission to the transition option. After successfully completing the NCLEX-PN will be eligible for admission? into the Transition Option. LPN or LPTN licensure must be obtained prior to entering nursing courses with a clinical component. Meet advanced placement testing and work experience requirements: Less than 12 months after LPN/LPTN graduation: No testing required for admission to Transition option. Greater than 12 months after LPN/LPTN graduation: No entry testing is required if during past 24 months have had at least 1,000 hours of nursing employment. Employment verification letters must be provided with the application. LPN/LPTNs who graduated greater than 12 months who have not had at least 1,000 hours of nursing employment must complete the Elsevier HESI LPN-ADN Entrance Exam. Exam results will show areas of weakness as remediation materials. LPNs/LPTNs are strongly encouraged to complete all remediation materials to improve chances of success in the nursing program. Be a graduate of a paramedic program affiliated with an accredited college or university. Hold current certification from the Arkansas Department of Health as an Arkansas Paramedic and be currently registered as a paramedic with the National Registry of Emergency Medical Technicians. Have proof of active employment as a paramedic for a minimum of 1,000 hours over the last 24 months. Volunteer work is not considered active employment. Submit employment verification with application. Employment verification letter must be on official letterhead and must include either the number of hours worked by the applicant OR a statement that the applicant has worked a minimum of 1,000 hours over the past 24 months. Applicants who work as a Paramedic for more than one entity may submit more than one employment verification letter if all worked hours total a minimum of 1,000 hours over the past 24 months. Complete the Elsevier HESI EMS-ADN Entrance Exam. Exam results will show areas of weakness as remediation materials. Paramedics are strongly encouraged to complete all remediation materials to improve chances of success in the nursing program. Students previously enrolled in another nursing program must forward a letter requesting a transfer and attach copies of all college/university transcripts. Letters and transcripts should be sent to the department chairperson. Students who are requesting a transfer from another nursing program are also required to provide a letter of eligibility to re-enter their previous nursing program in order to be eligible for consideration for entry into the UA Little Rock nursing program. If a student has failed a nursing course the request for transfer is classified as an academic re-entry request and re-entry policies apply. 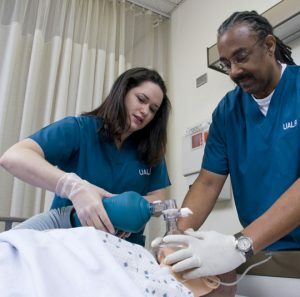 Students who have failed or withdrawn from more than one nursing course are not eligible for consideration for entry into the UA Little Rock nursing program. Transfer equivalency information for required core courses is available on the Arkansas Department of Higher Education website at acts.adhe.edu. It is the responsibility of the transfer student to confirm that transfer courses are equivalent to required core courses. Transition option students initially enroll in NURS 1415 Nursing Role Transition, which prepares them for their roles as registered nurses (RN). Upon completion of the AAS program, students are awarded 9 credit hours in nursing for NURS 1200, NURS 1202, and NURS 1505. Students enter in May and complete the program the following May. Maintain a minimum cumulative grade point average of at least 2.00 on all work attempted at the UA Little Rock. Students have the option of continuing into upper-level BSN coursework upon successful completion of NURS 2550 and NURS 2350. Transition option students initially enroll in NURS 1415 Nursing Role Transition, which prepares them for their roles as registered nurses (RN). Upon completion of NURS 2550 and NURS 2350, students are awarded 9 lower level nursing credits for NURS 1200, NURS 1202, and NURS 1505. Students enter in May and complete the program the following May. Completion of the Associate of Applied Science degree in nursing requires a minimum grade of C in all courses. Upon completion of all AAS required courses, students can apply to sit for NCLEX-RN state board exams. Students must apply for reentry if they withdraw or do not earn a C or higher in any nursing course. The Reentry Committee will review applicants for reentry and accept students based on clinical space availability. Students are allowed one re-entry per five years. Completion of the Bachelor of Science in Nursing requires a minimum grade of C in all required courses. Students must progress through all lower-level nursing courses with a C or better. It is recommended that students complete lower- and upper-level core coursework while completing lower-level nursing courses to graduate within four years. Students must complete NURS 2550 and 2350 to progress into upper-level nursing courses. Students will be eligible to graduate with an associate of applied science in nursing and apply to sit for NCLEX-RN exam upon completion of lower-level nursing courses. Students must hold a valid, unencumbered RN license prior to enrollment in some upper-level nursing courses. A minimum UA Little Rock cumulative grade point average of at least 2.00 on all work attempted at the University must be maintained. Students must complete upper-level nursing courses within 3 years of enrollment into NURS 3310. The Department of Nursing offers both a Traditional Option and an Accelerated Traditional Option for students seeking an Associate of Applied Science (AAS) in nursing. Seating is limited for both options. Students who are interested in the Accelerated Option must have all required core courses (detailed below) completed prior to the second summer semester of the program. However, preference is given to students who have completed or are in progress to complete all required core courses at the time of application. Additionally, preference is given to students who have not repeated, withdrawn, or failed required core courses. Students who are classified as Re-Entry are not qualified for the Accelerated Traditional Option. Students who request consideration for the Accelerated Option who are not selected will be considered for the Traditional Option. Transition option students initially enroll in NURS 1415 Nursing Role Transition, which prepares them for their roles as registered nurses (RN). Upon completion of the AAS program, students are awarded 10 credit hours in nursing for NURS 1300, NURS 1205, and NURS 1505. Students enter in May and complete the program the following May. UA Little Rock offers credit by examination with some restrictions for courses; see Credit by Examination under the “Academics” section of this catalog. Credit by examination for NURS 1300, NURS 1205, and NURS 1505 is available to qualified paramedics and to diploma program transfers with certain restrictions. Information about credit by examination in nursing courses is available from the Department of Nursing. Maintenance of required GPA (required core course(s) and UA Little Rock. Have proof of active employment (minimum of 1,000 hours) as an LPN/LPTN over the last 2 years. Volunteer work is not considered active employment. Submit employment verification letter with application. Employment verification letter must be on official letterhead and must include either the number of hours worked by the applicant OR a statement that the applicant has worked a minimum of 1,000 hours over the past 24 months. Applicants who work as an LPN in more than one facility may submit more than one employment verification letter if all worked hours total a minimum of 1,000 hours over the past 24 months. Or: A new LPN/LPTN graduate who has authorization to test for LPN licensure is eligible for conditional admission to the transition option. After successfully completing the NCLEX-PN will be fully admitted into the Transition Option. LPN licensure must be obtained prior to entering nursing courses with a clinical component. Hold current certification from the Arkansas Department of Health as an Arkansas Paramedic and be currently registered as a paramedic with the National Registry of EMTs. General: 61 minimum total hours, including 15 hours in residence. Laboratory credits include one credit for three hours of laboratory time. Minimum UA Little Rock GPA of 2.0. Grade of C or greater in all required core courses. Grade of C or greater in all required lower-level nursing courses. The Bachelor of Science in Nursing (BSN) Completion option offers RN graduates, of either an associate or diploma program, an avenue to pursue a BSN. The BSN ladder program offers UA Little Rock AAS graduates a seamless transition into the final year of the nursing program. The coursework for the BSN builds on the curriculum foundation of the core Registered Nurse program. It is available as an online program. The BSN program is accredited by the Accreditation Commission for Education in Nursing (ACEN), 3343 Peachtree Road, NE, Suite 850, Atlanta, GA 30326, (404) 975-5000. Additional information is located at the Department of Nursing website. Students may have 34 hours of lower level nursing courses waived for having a valid, unencumbered RN license. Students must achieve a C or greater in each of these courses. *Please note that the required statistics course is not a business statistics course. Remaining hours, if any, to reach 125 minimum total hours, 45 hours of upper-level courses (3000-4000 level), and/or 30 hours in residence. Note: Typically, a BSN student will have 8 upper-level unrestricted elective credits to fulfill. Completion of the baccalaureate of science degree in nursing requires a minimum grade of C in all upper-level nursing courses and required core courses. Students who do not successfully complete NURS 3310 may not enroll in additional upper-level nursing courses until a passing grade in NURS 3310 is earned. Students must maintain unencumbered RN licensure, maintain required nursing program documents and forms, and demonstrate professional conduct in the student role. A minimum UA Little Rock cumulative grade point average of at least 2.00 on all work attempted at the University must be maintained. The program must be completed in three years from the date of initial enrollment in NURS 3310. Courses which include integrated practice projects (IPP) are three credit hours theory and one credit hour lab. Grade of C or greater in of all required upper-level nursing courses.